Is it Possible to Get Credit After Bankruptcy? With an increasing number of households across the US experiencing financial difficulties, bankruptcy no longer holds the social taboo that it did in the past. But is there ever any way back once you have been declared as insolvent? Bankruptcy is undoubtedly a serious step and there are many different options to avoid bankruptcy which should be considered before deciding there is no other way to free yourself from debts. Consolidating is a possibility and loans can help to identify the right type of finance. Can you get credit affter bankruptcy? However, if you opt to take the plunge and file for bankruptcy, it is important to know that not all debts are wiped out by the order. Student debts, for example, are exempt from bankruptcy and must still be repaid in full. Other types of credit will be covered by the bankruptcy, such as the kinds of loans at moneysupermarket as well as credit cards and overdrafts. Creditors will in all probability shut any existing accounts, even if the balance is zero to prevent you running up any further debts. It can be difficult to obtain credit with a bad credit score, and a bankruptcy can make things worse. It is likely to be very difficult to obtain credit for at least 10 years and to stand any chance of rebuilding your credit score, it is imperative to ensure any credit entries are positive. 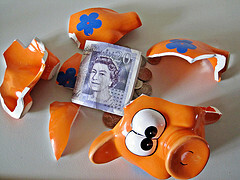 Any sign of ongoing financial problems will just exacerbate the situation even further. Although it will be very difficult to get credit and it is probably not a good idea to jump right back into borrowing again anyway, it is important to get some entries on your credit record to counterbalance against the bankruptcy. Repaying student debt installments is one way to help build up some points without borrowing more money. It is also essential that your credit file be updated to reflect the debts that were included in your bankruptcy petition. Unfortunately, this does not always happen automatically even though it should and showing undischarged debts can impact a credit file even more. Once the credit files have been updated, it may well be possible to qualify for a high interest credit card with a small limit. Even if no finance is needed, it can be a good idea to get one of these cards, ensuring you pay off the entire balance each month so you do not pay high interest charges. By doing this, you are demonstrating to creditors that you can be relied upon to make repayments as and when due, despite the issues you may have had in the past. Surprisingly for many people, it is possible to get a mortgage after being declared bankrupt, providing it was over six months ago, as a general rule. Of course, you would not qualify for the most competitive rate and your lender will need you to have some kind of deposit, but getting a home loan is likely to be easier than finding a new credit card. The good news is that mortgages build credit ratings back up very rapidly, which is the one essential thing after a bankruptcy. Those individuals who have gone through the bankruptcy process and are trying to rebuild their credit rating should be wary of bogus firms that either offer to ‘repair’ a credit file or offer a guaranteed loan. There are a number of fraudulent firms that prey on individuals who have been made bankrupt, as they know they will be more vulnerable due to their lack of options.